Solid center wound technology For golfers seeking a combination of long tee to green distance, wound ball spin, responsive feel and guaranteed cut-proof durability. It distance it self from the less expensive balls I play with the feel. 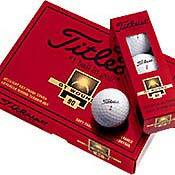 The Titleist DT Wound 90 & 100 are a great distance ball. A firm driver hit and a soft putting feel. Surprisingly durable. Wilson Smart Core(Straight Distance), Spalding Executive Titanium. Still the best blend of feel, distance, durability and consistency there is for the money. Less crazy about their new "DT-Spin" ball. It just sounds different. The best ball I've ever played. I hit it long, straight, and feels great. It checks up well on the greens too. Go buy a dozen of these today. This ball is too expensive. Top-Flite XL 2000 is just as good ball and it is half the price! I love this ball. It is really great. Lots and lots of feel, without sacrificing distance. It's just what you'd expect from a company like Titleist. The only downside is the price. It's not real bad, but for a dozen balls, $37 is a little steep. I didn't especially care for this ball. This price is right, $25/doz, but I just found that I was giving up too much on the driver and also buying too much spin off the driver. I much prefer the DT distance, the trade off on stopping that ball is not as bad. Callaway Rule 35, TM Inner Gel, Titleist Professional. Great ball for the price you pay. Doesn't spin as much as the higher priced balls but is sufficient for most purposes. I am a fan of all Titleist balls. I found this ball to be the best value. I can spin it, work it and it has plenty of length. Some of the new Titliest balls do this but for a higher price. A great ball if you don't mind a wound type. Its not that hard & gives a good back spin. Its better than the HP2 tour in terms of softness. It's a great substitute for a Balata ball as it does not cut easily. Reasonable price. Go for it. Maxfli Balata, Titleist HP2 tour & Balata, Topflite XL & Strata types.